Millencolin is a punk rock band that was formed in October 1992 by Nikola Sarcevic, Mathias F�rm, and Erik Ohlsson in �rebro, Sweden. In early 1993, drummer Fredrik Larzon joined the band. 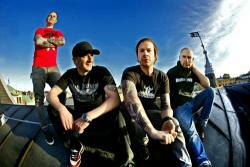 The name Millencolin is derived from the skateboard trick "melancholy".